Dog, tree, table is a group exhibition featuring artists Susan Metrican, Austin Ballard, and Harry Gould Harvey IV, curated by Corey Oberlander and Lindsey Stapleton. Dog, tree, table presents works by three artists working in nuanced forms of this concept by altering the viewers’ perception of the ordinary through various forms of presentation and material alteration. Susan Metrician recreates objects by confusing or altering a prime characteristic of the object’s existence: scale, context, or the object’s level of completion. Shoes, pants, shirts, body parts, plants and patterned fabrics call to a domestic content focusing on formal investigations of perception and the viewers’ relationship with perceived viewing plane. While trompe l’oeil has its particular connotations in art history, it is difficult to ignore this characteristic while navigating the complex (literal and figurative) layers of Metrican’s works. Susan Metrican (born 1977, Miami, OK) currently resides in Boston via Bangkok, Toronto, and NYC. Metrican received an MFA from the Massachusetts College of Art and Design, her BFA from the Kansas City Art Institute, and attended Skowhegan School of Painting and Sculpture in 2014. Metrican’s work has been included in exhibitions nationally including: Proof Gallery (MA), Boston Center for the Arts (MA), Field Projects (NY), Knockdown Center (NY), and Gallery Protocol (FL). Metrican is also one of four founding members of kijidome, an experimental project space and collaborative. The space presents curatorial projects and events by its four founders and invited guests. In his recent series Weighted Palm and Dappled Dune, Austin Ballard implements woven cane webbing, commonly associated with antique furniture or functional artifacts. The most common experience with this material typically exists in a format where repair or discard is imminent, due to unwinding or snapping of the flexible, yet brittle cane material. Ballard has chosen to reinforce these materials by dappling the open weaves, or by completely filling the vacant shapes with plaster or paint, moving to solidify the safety and future of the object. 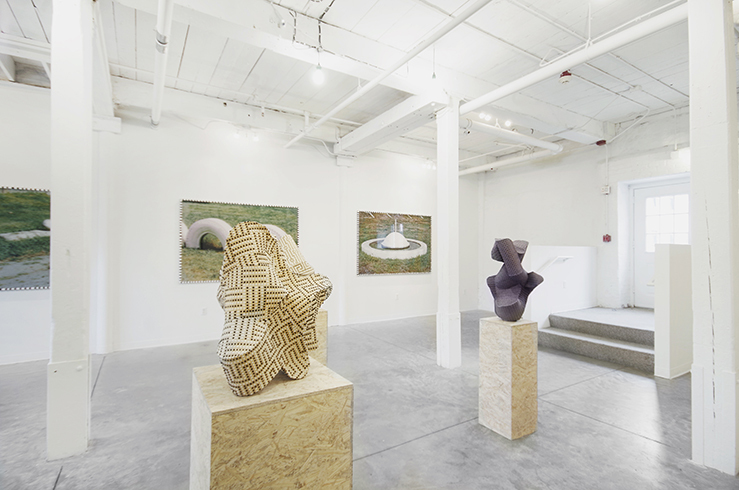 In the forms themselves, reminiscent of scholar’s rock formations (or “viewing stones”), Ballard’s works take a contemporary approach to Modern sculpture through an avenue nodding to art history. Austin Ballard (born Charlotte, NC) lives and works in Ridgewood, NY. He recently held residency at Fine Arts Work Center in Provincetown, MA and Museum of Art and Design in New York. He’s show at a number of international institutions including Field Projects (NYC), Beer Contemporary (London), The McColl Center (Charlotte, NC), and Wassaic Project (NYC). Focusing on a different form of demonstration, Harry Gould Harvey IV presents objects in the form of framed photographs. Harvey does this by transforming a space into a composition, or a space into an object or an object into an object, or a space with the consideration of an object becoming a composition. The artist’s works depict decorative elements placed in grassy areas, seemingly devoid of function. They are composed in a way that suggest the objects are completely inert, especially in such a desaturated and monochromatic figure-ground environment. The third image, is a cropped focus on a series of white-painted-car-tires cemented in a grassy plain as a barrier or as an apparatus on a playground. While it too can be perceived as inert or functionless, it does also lean towards a sort of potential energy. All framed in white with black hand-painted stripes, Harvey emphasizes the importance of the image by contextualizing them with an exterior aesthetic occasionally associated with folk art, graphic emphasization, or non-western design. Harry Gould Harvey IV is a self taught interdisciplinary artist born in Fall River, MA. He’s recently exhibited at Farewell Books (TX), Proxy (RI), and SPRING/BREAK Art Show in New York during Armory Week.